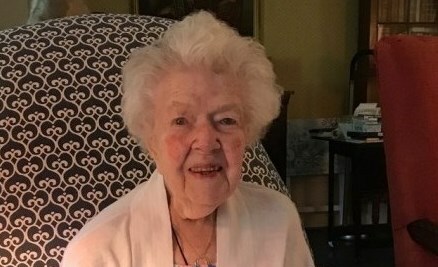 Mary Louise (Miller) Ware, 100, of Southborough, was born in Cannondale, Connecticut in June of 1917, the third of four children of David Henry and Mary Frances (Raymond) Miller. She was a graduate of Wellesley College, Class of 1938, where she majored in music. Even at 100 years old, she remained intellectually curious. She was the beloved wife of the late Dr. Paul Francis Ware, from Clinton. She is survived by her 8 children Mary W. Roddy and her husband Thomas of Washington, DC; Paul F. Ware and his wife Susan of Concord; Constance W. Zaia and her husband John of Arcadia, California; Delia W. Keefe and her husband Francis of Chapel Hill, North Carolina; Esther W. Salmon and her husband Edward of Dedham; Nancy E. Ware, Cincinnati, Ohio; Sarah C. Ware, Olney, Maryland; Margaret W. Bush and her husband Jonathan of Northborough; her 20 grandchildren and 17 great-grandchildren. A funeral mass will be celebrated on Monday, March 26, at 11:00 AM, at St. Anne Church, 20 Boston Road, Southborough. Burial will follow in the Southborough Rural Cemetery. In lieu of flowers, memorial contribution may be made in her memory to Kindred Hospice, 406 Hemenway Street, Marlborough, MA 01752. Arrangements are under the care of the Morris Funeral Home, Southborough. To leave words of condolence to the family, please visit morrisfuneralparlor.com.